The Zeeland setting. As the 19th century Dutch economy became more connected to the broader Atlantic economy, the Dutch agricultural sector experienced a severe economic depression from the late 1870’s until the 1890’s. The price of wheat dropped by half between 1878 and 1896. As farmers switched to other crops such as potatoes or sugarbeets, these, too, dropped in price. There was good reason to fear that cheap foreign foodstuffs would lead to complete economic collapse.A number of factors contributed to rural residents leaving the Netherlands. Government policy required that farms be subdivided equally between children, gradually reducing farm sizes into uneconomic units. When this happened, richer neighbors or outside land investors often bought the farms, turning the original landowners into day laborers or migrants. Small renters were worse off. Their parcels were on marginal land and leases were annually renewable. If a renter was put off his land, it often made more sense to sell his possessions and leave. Through the 19th century, most Bustraans were either day laborers or renters. 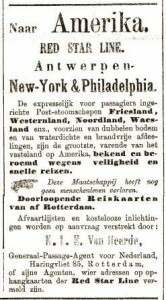 “To America.” Britain’s Red Star Line was still advertising passage to America from Antwerp in this 8 May 1894 clipping from the Courant of nearby Goes, two years after my great-grandfather Adriaan left Wemeldinge. Red Star stressed fast and safe travel. 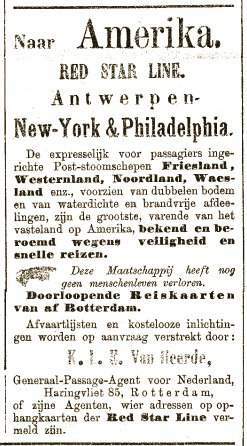 Adriaan, his pregnant wife Maatje, and seven children sailed on the Waesland, a twenty-five year old vessel carrying 120 first class passengers and 1,500 in steerage. The nine immigrants arrived at the newly-opened Ellis Island immigration station in New York Harbor on 20 April 1892.